1. So how about I have the largest iCloud plan for my phone and my iCloud storage is FULL. How is it that me, who is basically technologically challenged, has used up all of the iCloud storage? There have to be so many people out there who use it up more, right? What the heck do I dooooo. No time to go through and delete my 139K photos. Yep. That’s real. 2. Dying for a huge scoop of coconut milk chocolate ice cream. Yes please. 3. Over the weekend I did a major major closet clean-out and it felt fabulous. I’m ruthless when it comes to getting rid of things, because the best thing I’ve ever heard is that if something comes back in style in a few years, it won’t be the same exact style. With that being said, I definitely got rid of puffy vests from high school. Hmmmm. Why can’t I be this ruthless about my digital closet. 4. I was great at achieving “inbox zero” before I had Max. I would have zero emails almost every single day. Then, it all went downhill and now I’m sitting at a nice almost 8K in my inbox. STRESS. See #1 and #3. 5. Speaking of, I’m totally one of those people who can’t have ANY notifications on the front of their phone. None. No thanks. It’s anxiety inducing. So even if I don’t have time to respond to the messages, I must open them in order to remove the notifications. Like a crazy person. 6. OMG what the heck happened on The Affair omg omg omg. Can you even believe that really happened?! It feels so incomplete but I guess we will find out more this week. Also, new show alert! Eddie and I watched Yellowstone this weekend and we are absolutely obsessed. So so so so good. I’ve always been a huge fan of Kevin Costner and he is perfect in the show. 7. I got sucked into such a Facebook deep dive a few nights ago. We are talking, like, back so far that I was looking up people from elementary school. Pretty much loathe FB for personal reasons but love it when I feel like looking up random people. I mean stalking. 8. Oprah on her perfect date night. God I love her. 9. This version of Tuesday things was quite tech heavy which is not representative of my life whatsoever. But this is the 370th post of Tuesday things. I’m half embarrassed and half excited. 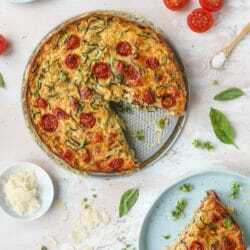 Zucchini Pie with Burst Tomatoes. One Pot Peach Basil Chicken. I don’t use Apple anything but isn’t the whole point of iCloud is to download your photos so they can be removed from your device? Try Google photos that’s what it does! I’m so with you on the notification thing! I have to get it off there! It also like gives me anxiety when I see a notification on someone else’s phone. I’m like, how can you live like that?! I’m 100% with you on #3 and #5. Another vote for Google Photos! Free backup of photos right away any time you are on Wifi. It is the best and they are easy to access later on. #5!!! OMG it is totally stress inducing. OMG yes too many notifications stress me out!! Also, the little red one at the top of app does it to me too! Saturday I cleaned out my closet and gave away all the clothes I no longer wanted or could wear. It felt so good to get rid of things that were only taking up space. I also agree about the iCloud and the notifications. Drives me nuts. I haven’t used it yet, but just heard about an app called Alpaca that will sort through your photos and find the similar ones so you can delete duplicates. Might helps at least a little bit! My husband takes 10,729 photos a week, and we use Google photos. The search capability is astounding, including facial recognition. It reduces the requirement to organize. HOWEVER, I like things curated. One of the gifts I’m giving myself for my birthday is hiring someone to sort and organize my photos. We have an external hard drive that is wifi connected. That way we can send our personal pictures to that and not have to worry about the cloud or storage on it. There is something so safe about a physical copy I can see and control myself. OMG THE AFFAIR! Talk about a well kept secret. Did not see that coming – and kind of want it wrapped up in the next 2 episodes. Like, can we not have a two season Scotty Lockhart-esque drama? Was reading that while renewed, season 5 will be the last. I try to always have inbox zero! Some weeks it happens, some weeks it doesnt! In regards to your phone, I would recommend you turn off “Live Photo” and just take stills. It is rare that I prefer a live photo plus take up a TON of space & you need to edit them to reduce it (which takes time I don’t have.) Also, I turned off ALL of my phone notifications except phone calls, texts & Facetime. I don’t need to get Facebook, Insta, Twitter or new email updates sent to me–I’ll get them when I log in. Try it. Now that I’ve shared some tips, could you please come over & help me clean my closet?! Puuuuleeeease? I’m the worst. I’m a crazy notification remover, too! I hate it so much. The fact is that Ruth Wilson wanted out of the show’s they killed her off! What a shock! i agree i also use google photos. i will be damned if i pay for any cloud space ! also notification…omg they must be removed but i do not use them for many things because i find them annoying. inbox zero is a goal that i will never accomplish. I have 19,800 unread emails. The.Struggle.Is.Real. I don’t even want to open my gmail account that I used to use.